Syrian regime might use chemical weapons - how is that possible? In what can only be regarded as an embarrassing turn of events for the Obama Administration, U.S. intelligence agencies are warning that the Syrian regime of Bashar al-Asad may again resort to the use of chemical weapons against Syrian rebel forces, or the forces of the al-Qa'idah affiliate in Syria known as Jabhat al-Nusra (the Victory Front) and possibly the fighters of the so-called "The Islamic State" (more commonly known as the Islamic State in Iraq and Syria, or ISIS). Syrian forces are under pressure as they try to fight on multiple fronts against the various groups arrayed against the regime. Although the anti-regime forces usually do not cooperate with each other, or coordinate their operations against the Syrian army, nonetheless they are taking a toll on the Syrian military. The recent introduction of the American-made TOW anti-tank guided missile has increased the capabilities of at least one of the anti-regime forces against Syria's army and militias. Why is this intelligence assessment embarrassing to the Obama Administration? In the summer of 2013, Syrian forces conducted chemical attacks on Free Syrian Army positions in the eastern suburbs of Damascus called the East Ghutah. The chemical used in the attacks was the nerve agent sarin (known as GB in the chemical warfare community), delivered by artillery rockets. Almost 1,500 people - mostly innocent civilians - were killed in the attacks. Only months earlier, President Obama stated in a news conference that if the United States intelligence community detected the movement of Syrian chemical weapons from storage depots, he would be inclined to take action to preclude the Syrian regime's use of the weapons. Although it appeared that President Obama was waffling in his decision to take the military action he had threatened, his advisers warned him that what remained of his credibility was at stake. Reluctantly, he ordered the Pentagon to ready military strikes on Syrian chemical warfare facilities. However, our generally ineffectual Secretary of State John Kerry made an off-hand comment at a news conference that the Syrians could avert American retaliation by giving up their stockpile of chemical weapons. Anyone* who has ever worked or lived in Syria got a chuckle out of the thought that the regime of Bashar al-Asad would give up his chemical weapons. Syria maintains its chemical weapons arsenal and delivery systems to provide a deterrent against an attack by the vastly-superior (and nuclear-equipped) Israeli armed forces. Its ballistic missiles and squadron of SU-24 (NATO: FENCER) fighter-bombers can deliver chemical weapons virtually anywhere in Israel. The thought that the Syrians would give up their chemical weapons arsenal was, and remains, ludicrous. However, the Syrians' primary sponsor - Russia - saw an opportunity to back Kerry and the United States into a corner. The Russians announced that they had brokered a deal in which the Syrians would give up their chemical weapons in return for an American commitment to call off impending military action against Syria. Obama jumped at the chance. This "deal" put in motion a carefully orchestrated charade by the Russians and Syrians. Almost immediately after al-Asad's acceptance of the Russian-brokered agreement, there were numerous flights of Syrian Air Force IL-76 (NATO: CANDID) heavy transport aircraft between Syria and Iran. One has to wonder about the cargo of these sorties that occurred days after the Syrians agreed to surrender their chemical weapons. The Syrians did surrender tons of chemical weapons and precursor chemicals, including artillery shells and aerial bombs, to the United Nations organization tasked with the implementation of the removal and destruction of the Syrian chemical arsenal. However, at no time did the Syrians surrender any warheads designed for their arsenal of Russian, Iranian and North Korean ballistic missiles, missiles that can range virtually any spot in Israel. I think it safe to assume that these warheads are now located either at a location in Syria considered to be safe, or have been moved to safe haven in Iran, or a combination of both. So now in the early summer of 2015, American intelligence issues a warning that the Syrian regime may be contemplating the use of chemical weapons. Is anyone asking where these chemical weapons came from? Was there not a huge victory lap in 2013 as Syria agreed to rid itself of chemical weapons? Is any one going to be held accountable for being so gullible as to believe that the Syrians were going to surrender their entire chemical weapons arsenal? Or was it all a charade on both sides to give the Obama Administration an out from having to follow up on a "red line?" * From 1992 to 1995, I served as the Air Attaché to the U.S. Embassy in Damascus. It was part of my brief to monitor the capabilities of the Syrian armed forces, including their chemical warfare capabilities. 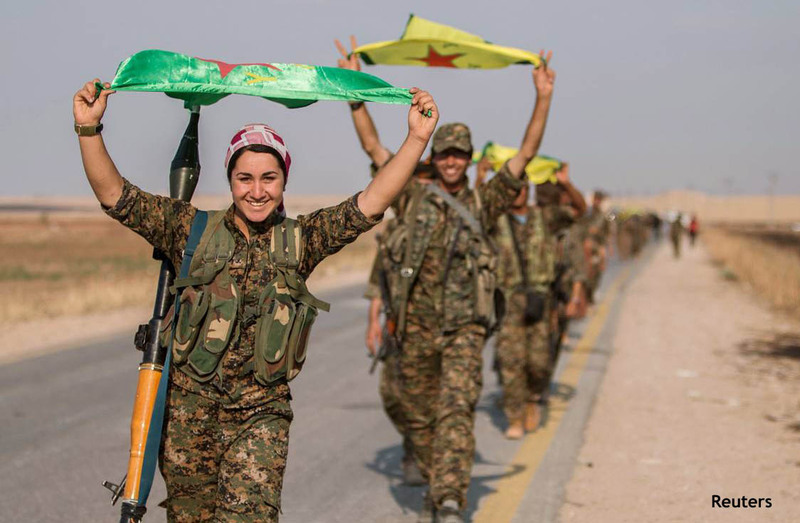 The Kurds - key to success against "The Islamic State?" The so-called Islamic State, more commonly called the Islamic State in Iraq and Syria (ISIS), has suffered few military setbacks. The one that the Iraqi and American governments like to tout is the retaking of the city of Tikrit by Iraqi forces in April of this year. Unfortunately, that "military success" was despite a series of mistakes and missteps on the part of the Iraqi forces and their Iranian-backed militia allies. It was only after tens of thousands of Iraqi forces had been fought to a standstill by less than a thousand ISIS fighters holed up in the city that American airpower had to be employed to save the day, after which the city fell to the Iraqis. The battle to retake Tikrit did serve as a wake-up call for the Iraqis and their refocused American allies. It demonstrated just how ineffective the Iraqi Army has become, despite the infusion of American arms and training, and how ineffective the Iranian-backed militias are in the face of a determined enemy rather than ill-equipped, untrained Sunni Iraqi civilians. Those two lessons were reinforced just weeks later as the Iraqis were unable to prevent ISIS forces from seizing the city of al-Ramadi, the capital of al-Anbar province--a mere 75 miles west of Baghdad. The Iraqi military and security forces continue to falter in the field. There is one area that often goes overlooked--for several reasons, not the least of which is political. Many military analysts (me included) have assessed that among the Iraqi forces, the Iranian-backed militias are more effective. That is true as far as it goes, but if you consider the Kurdish peshmerga units as part of the mix, the assessment changes. The Kurds are easily the best fighters of them all. It was the Kurds, backed by American airpower, that regained control of the Mosul Dam, a key infrastructure facility in northern Iraq that had fallen to ISIS when the Islamist group routed the Iraqi Army units in the city. Mosul remains in ISIS hands, but the dam and other parts of the countryside have been retaken by the Kurds. The major problem the Kurds face is a lack of modern weaponry, especially heavy weapons--artillery, tanks, anti-armor missiles, etc. Because of our (short-sighted, in my opinion) commitment to the Shi'a-dominated, Iranian-influenced, poorly-led government of Prime Minister Haydar al-'Abadi, all weapons and military equipment provided to any Iraqi units, including (or more likely, especially) the Kurds, must go through the defense establishment in Baghdad. Unfortunately, the inept and almost certainly corrupt leadership in the Ministry of Defense provides very little of the materiel to the Kurds. The Arab Iraqis--Shi'a and Sunni alike--have always been, and remain, wary of the Kurds and are skeptical of the Kurds' commitment to the current makeup and sovereignty of Iraq. Many believe that the Kurds are hoping to establish their own country, possibly in conjunction with their cousins in what is now Syria, or what the Kurds call Rojava or Western Kurdistan, and ultimately with the Kurds in Turkey. That last part--"ultimately with the Kurds in Turkey"--is the source of much consternation between the Turks and the West over any Western support for the Kurds. The Turks view many of the Syria-based Kurdish militias as mere extensions of the Kurdistan Workers' Party, known better by its Kurdish abbreviation, the PKK. The PKK has been designated as a terrorist organization by the United States and many of its allies. The Iraq Arabs may in fact be right about the Kurds and their ulterior motives, but that is an issue for another day. The current focus needs to be on the extermination of ISIS, or more politely put by President Barack Obama, to "degrade and ultimately destroy" ISIS. While the Iraqi Arabs do not seem to be capable of taking the fight to ISIS, the Kurds in both Iraq and Syria have demonstrated that they are not only capable, but willing, to do so. By way of example, let's look at how effective the Kurds in northern Syria have been. We are all familiar with the tenacious defense the Kurds put up in the small border town of Kobani. The failure of ISIS to take and hold Kobani is not only a testament to the fighting capability of the Kurdish peshmerga, but validates the American tactic of using U.S.-led coalition airpower--in this case extensive use of U.S. Air Force B-1 bombers--in conjunction with indigenous ground forces. It also demonstrated that it is possible to have the Turks allow the Kurds in Iraq to provide weapons and materiel to their cousins in Syria via Turkish territory. The map above illustrates what the Kurdish People's Protection Units, more commonly known by their Kurdish initials as the YPG, have been able to accomplish against ISIS--albeit with considerable American airpower and some ground support from elements of the Free Syrian Army (FSA). Even after the YPG success in forcing ISIS to withdraw from Kobani, ISIS still maintained two major lines of communications--its major logistics routes--from the Turkish border near the cities of Jarablus and Tal Abyad (west and east of Kobani, respectively) to its self-proclaimed capital city of al-Raqqah, about 65 miles south of the Turkish border. After the victory at Kobani, YPG forces began moving toward Tal Abyad from both the east and west. After an intense battle--with heavy American air support--the Kurds were able to seize the border city from ISIS on June 15, 2015. Tal Abyad had been in ISIS hands for almost one year. After the Kurds had established themselves in Tal Abyad, they began to press their advance both southwest and southeast. Their ultimate target is al-Raqqah, but there are intermediate targets as they move towards the ISIS capital. With the fall of Tal Abyad, ISIS had lost one of its two major supply lines from the Turkish border to al-Raqqah, forcing it to rely on the border crossing to the west of Kobani. 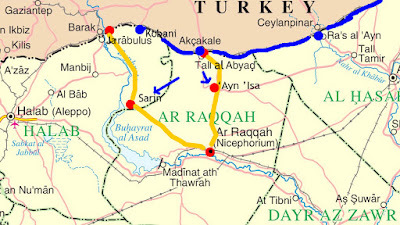 That route goes south along the Euphrates River to the city of Sarrin, and after that across the desert via the strategic crossroads at 'Ayn 'Isa or continuing along a longer route along the river. The Kurds, who live in this area, are well aware of the lines of communications and the road network. ISIS requires logistics to keep its "state" and "military" running--they also need to move money and contraband oil. 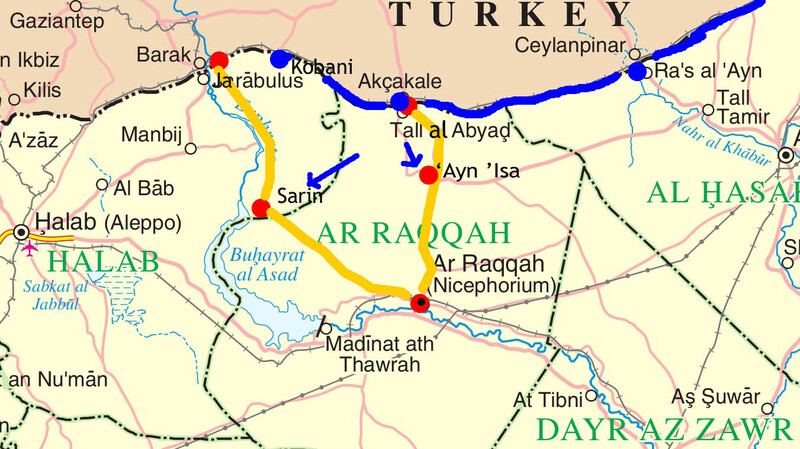 The Kurds began to move towards the two key cities of Sarrin and 'Ayn 'Isa, hoping to cut ISIS off from its direct lifeline to the Turkish border and forcing it to rely on alternate lines of communications further to the west, areas where they are facing pressure from other armed groups. With increased U.S. airstrikes, the YPG was able to seize control of the city of 'Ayn 'Isa on June 23, along with a large Syrian Army base that has been used by ISIS, and the crossroads. This puts YPG fighters witihin 30 miles of al-Raqqah. Also, Kurdish forces backed by some FSA fighters have surrounded the city of Sarrin, which lies in a key position north of the militant group’s de-facto Raqqa capital. It means that there is an opportunity for the Obama Administration to "reset" (they are big on "reset buttons") the strategy and tactics used to combat ISIS. The Kurds in both Iraq and Syria have demonstrated the ability to fight ISIS effectively. They have been able to repeatedly seize and hold territory, something the Iraqi government forces seem incapable of, or unwilling, to do. The original Obama Administration plan to "degrade and ultimately destroy" ISIS was the use of airpower (overwhelmingly American) coupled with someone else's "boots on the ground." In Iraq, that was to be the retrained and re-equipped Iraqi Army. In Syria, it was to be an initial cadre of 5,000 FSA fighters who would be trained and equipped by the United States. That hasn't worked out well (I am being polite - it has been an abject failure). What has worked, however, is the use of the Kurdish peshmerga in Iraq and the Kurdish YPG in Syria. Both have been effective on the ground against ISIS, and both have worked effectively with American air support. In Iraq, we should quit our current focus of attempting to train/retrain Iraqi soldiers who just don't seem interested in fighting to save the Sunni Arab portions of Iraq. We also should withdraw any support or equipment that might benefit or fall into the hands of the Iranian-backed--and Iraqi government-supported--Shi'a militias. All the support efforts--including training, equipment, air support, logistics support, etc.--should be directed to the Kurds, without any interference from Baghdad. I would assess the Iraqi government in Baghdad as being part of the problem, not part of the solution. This is really no longer about Iraq and its half-hearted--and I am being generous--efforts to create an inclusive government or to field an effective army capable of retaking Iraqi territory. It should now be about directly addressing the threat to the United States posed by ISIS--the President has stated that ISIS is a threat to the United States. If so, let's use whatever means necessary to defeat them--if that is working solely with the Kurds, so be it. If ISIS is not a threat to the United States, it's time to say goodbye (and good riddance) to the failed Iraqi Shi'a government. For Syria, the Administration should "reset" as well, this time shifting its training and equipping resources to the Kurds. They are willing to fight ISIS, while the FSA is more focused on the removal of Bashar al-Asad--we can worry about Bashar after ISIS is gone. Time to back the winners for a change. * Disclaimer: I served in northern Iraq as part of a U.S. government effort to support the Kurds. I have always supported their efforts to establish a national homeland. 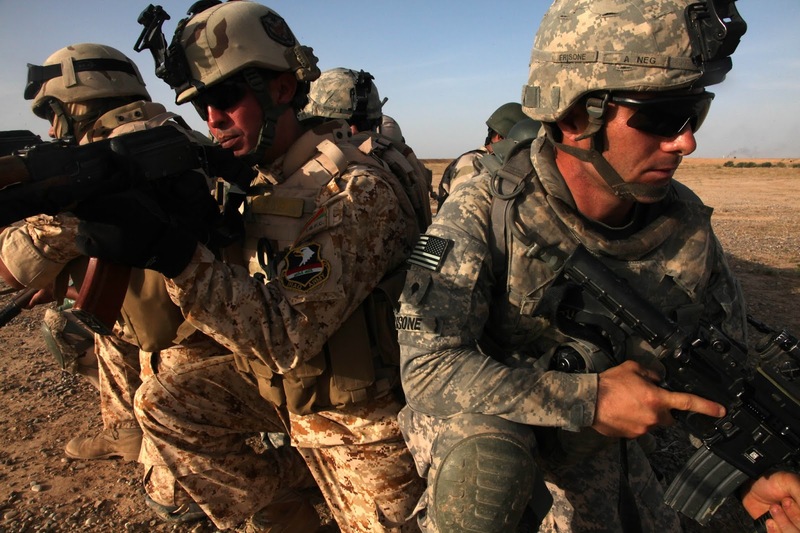 A few days ago, President Barack Obama ordered an additional 450 U.S. military advisers to Iraq to augment the 3,100 American troops already there. According to news reports, these additional troops will deploy to al-Anbar province in western Iraq, a Sunni-dominated area under pressure from fighters of the so-called Islamic State, or the Islamic State in Iraq and Syria (ISIS). The capital city of al-Anbar province, al-Ramadi, recently fell to ISIS, despite Iraqi security forces efforts - army units, militias and police forces - to prevent ISIS from seizing the city. The fall of al-Ramadi was a serious blow to the Iraqi government of Prime Minister Haydar al-'Abadi - the city is a mere 65 miles west of Baghdad. To make matters worse, ISIS is now moving down the Euphrates River valley towards the second city of al-Anbar province, al-Fallujah. Al-Fallujah, a name well known to American troops because of the intense fighting in the city in past years, is only 30 miles west of Baghdad. While a direct ISIS assault on Baghdad itself is not likely, we can expect to see an increase in the number of suicide attacks and bombings in the Shi'a sections of the capital. The President's decision to send more troops is an admission that either his current strategy - or the execution of that strategy - is failing. In 2014, the initial small cadre was deployed to Baghdad to assess and re-train the Iraqi army following the humiliating collapse of several Iraqi Army divisions as ISIS seized Mosul (al-Mawsil), Iraq's second largest city. That was one year ago - since then, ISIS has expanded its territory in both Iraq and Syria despite the U.S.-led coalition air campaign and Iraqi military operations. The Obama strategy - which has been in place for a year despite the President's claim last week at the G-7 meeting in Germany that he was still waiting for a strategy from the Pentagon - was to use U.S.-led coalition airpower in conjunction with Iraqi boots on the ground. That sounds good on paper, but I think reality has set in at the Department of Defense. Iraqi forces are in such poor condition - thanks to the premature withdrawal of American trainers/advisers in 2011 - that they are incapable of functioning as coherent military units. The Obama Administration has lost much of its credibility through its constant claims that ISIS is on the defensive, that it cannot mount offensive operations, that thousands of its fighters are being killed, that Iraqi forces are on the rebound. Those statements fly in the face of reality. Looking at recent Iraqi military operations, the only one that could possibly be construed as a success is the retaking of Tikrit. In reality, however, that was basically an Iranian-backed Shi'a militia operation using heavy artillery to turn large parts of the city into piles of rubble. Even after that, it required the withdrawal of the militias and application of American airpower to finally finish of the much smaller group of ISIS fighters tenaciously holding on in the city. Almost immediately after the President announced his strategy in 2014, Iraqi leaders postulated that it would only be a few months before they would retake the city of Mosul from ISIS. The initial claims of the Administration strategy was to provide the Iraqi political leadership and the military forces the "time and space" needed to regroup and launch a campaign to retake Mosul "in a few months." That bluster fell by the wayside when the first American trainers provided their assessment of the current state of the Iraqi military. Given what we have seen in the last year, the idea of Iraqi forces retaking Mosul anytime soon is ludicrous. While the Tikrit operation was bandied as a success for the Iraqi military and American strategy, ISIS was able to move enough forces - despite uncontested American air operations over the entire country - south to encircle and seize al-Ramadi. How was that possible? Either the strategy of American-led airpower combined with Iraqi "boots on the ground" is flawed, or it is not being executed properly. The basics of a successful strategy are there, but needs substantial modification. There are things the American military does better than anyone else in the world. One of those is the application of airpower, and the other is the use of combined arms - air and land forces employed together in what has become known as the AirLand Battle. If the Obama Administration would apply elements of what we do best, the situation in Iraq can be turned around. It will not be because we are deploying 450 additional advisers to expand and continue executing the same failed strategy. How do we fix this? Assuming that we are not going to deploy American combat troops to fight ISIS, we can work with a modified version of the Obama strategy. First, the air campaign has to be a real air campaign, not the anemic effort that is currently being waged. There is no reason that ISIS should be able to move on the roads in Iraq (or Syria). Given the complete dominance of the air and the capability of the array of intelligence and surveillance sensors available to the air battle planners, the U.S.-led coalition should be able to stop ISIS in its tracks. Of course, that requires that the White House stop micro-managing battlefield operations half a world away. U.S. pilots constantly complain about the cumbersome chain of command and long delays in approvals to conduct offensive operations - approvals they should already have before they take off. When they can clearly see ISIS engaged in logistic support or actual combat operations, let our pilots do their jobs. See my earlier piece on this: Why is American airpower not stopping ISIS? (March 2015). Combined with streamlining the target validation process, the pilots need better "eyes on target" - that means American eyeballs on the ground with Iraqi troops designating targets. The U.S. Army and U.S. Air Force have been doing this effectively for decades - teams with ground units who can not only designate targets, but provide tactical control, immediate fire correction and instant damage assessment. To utilize airpower to its fullest - especially when you have troops in contact - you need these tactical air control parties (TACP) on the ground. We have people who do this as a profession - get them into the fight. In conjunction with putting these TACPs into the fight, embed U.S. Army or U.S. Marine Corps officers in Iraqi military units to provide advice and assistance and work with the TACP personnel to maximize U.S./coalition capabilities in support of Iraqi military operations. If the American troops are truly advisers, they need to be out in the field with the units they have trained. You cannot "advise" from a secure base tens of miles away. The President and the Secretary of Defense have a serious decision to make, and they need to make it soon. If they are serious about achieving the President's stated goal to "degrade and ultimately defeat" ISIS, they need to refine the rules of engagement and get into the fight. As it stands now, we are merely reacting to ISIS's moves - that's not how you win wars. Yes, Mr. Obama, this is a war. American forces are in harm's way all day, everyday - let them do their jobs. You keep reminding us that you are the Commander in Chief - now is the time to start acting like it. I don't normally respond to irate readers or personal attacks based on my commentaries - I get enough hate mail and death threats via the viewers of CNN. I thought I would take the time, however, to respond to this young Assyrian woman. I am sure she is sincere and means well, but her comments are so misguided that I wanted to inject some reality into her "don't bother me with the truth" notions of her former country. These comments were left in response to my article on the death of Tariq 'Aziz, a convicted war criminal who was sentenced to death by an Iraqi court. See Tariq 'Aziz - dead at 79 (June 7, 2015). By way of background, the reader (whose name I am withholding) is a Chaldean (Assyrian) Christian woman born in Baghdad, but now living in the United States. At times she uses the term "we" to mean Americans, so I assume she plans on staying in the United States. (Reader) [Tariq Aziz] helped protect Iraqi Christians and let's be honest Iraq was a functioning country under the Baathists. It has turned into a complete s***hole. Tariq Aziz loved his country and was a loyalist. The Baathists would not have allowed Jihadists to destroy Iraqi historical artifacts and destroy the country. People could travel to work and school and live their lives under the Baathists. We replaced a secular government in Iraq with a theocracy which now belongs to Iran. (Reader) Iraq is a completely destroyed country. And the sectarian is everywhere in Iraq, one group isn't better or worse than the other. Kurds have been stealing Christian villages in Northern Iraq terrorizing minorities in Iraq for 100 years. Maliki was also a dictator but was bad at his job the Shias have been doing the same thing to the Sunnis that the Baathists did to Shias. So what's the difference? Difference is the Baathists kept the country secular, secure from foreign terrorists, and functioning. (Reader) The best advice for US intelligence other intelligence agencies when it comes to stabilizing Iraq warding off Iran is help another SECULAR group take Iraq back. (Reader) I'm Chaldean and I'm proud of Tariq Aziz. Rest in peace! (Reader) Spoken by a person who helped destroy Iraq. Thank you for destroying Iraq and for destroying my ancient Mesopotamian Christian community's 7,000+ year presence on our ancestral homeland. First of all, I did not destroy Iraq. The destruction of Iraq was preordained by ruthless psychopaths like Saddam Husayn and yes, your beloved Tariq 'Aziz. In fact, had you bothered to do any research about me at all, you would have discovered that I was one of the Americans in 1987 and 1988 that likely saved Iraq from certain defeat at the hands of the Iranians. Had the United States not provided American intelligence information to the Iraqi military, the Iranians would have marched into Baghdad by mid-1988. There is no such thing as an "ancient Mesopotamian Christian community's 7,000+ year presence on our ancestral homeland." Assyrians, yes - Chaldeans, no. Let's look at the man you are so proud of. Tariq 'Aziz was Saddam's key foreign policy and national security adviser. Tariq 'Aziz did not love his country - he loved the power and prestige that being a member of Saddam's inner circle provided him. If he loved Iraq, he would not have helped Saddam Husayn take it down the path of destruction. On his watch, 'Aziz advised Saddam Husayn to invade Iran in September of 1980, an event that caused an eight-year bloodbath for both countries. It was the Shi'a Iraqis and the Kurds who paid the price for Saddam's - and Tariq 'Aziz's - blunder. If that wasn't enough, the decision to invade Kuwait in August 1990 was agreed to, and later defended, by Tariq 'Aziz. That led to the needless death of hundreds of thousands of Iraqis and Kuwaitis, displacement of others, brutal repression of the Shi'a and Kurdish populations and the continued isolation of Iraq from the rest of the world. Let's not forget the use of chemical weapons on thousands of Kurds at Halabjah, use of nerve gas on Iranian troops at al-Faw, Shalamjah, Majnun, etc., the environmental disaster of the oil release into the Gulf, lighting 600 Kuwaiti oil wells on fire, continuous refusal to cooperate with the United Nations - the list goes on and on. At the center of it all was one key adviser - Tariq 'Aziz. Your romantic notions of the Ba'this are misplaced. I assume you are too young to remember, or simply chose to ignore, the brutality that was the Saddam Husayn dictatorship - all supported by Tariq 'Aziz. I suggest you do some more research before you blindly canonize the Christian-in-name-only Tariq 'Aziz. Tariq 'Aziz - dead at 79. To many Westerners, Tariq 'Aziz was the face of the brutal regime of Iraqi dictator Saddam Husayn. His polished demeanor, ability to effectively communicate in English, and the fact that he was a Christian convinced many of his contacts around the world that he might have the ability to provide wise advice and counsel to the Iraqi strongman, and hopefully ameliorate some of Saddam's self-destructive behavior. Foreign politicians believed he could be the voice of reason in an unreasonable regime. They were wrong. Tariq 'Aziz was a true believer, committed to the cause of Arab Socialist nationalism, a Ba'th Party devotee. He was about as close to Saddam Husayn as anyone outside Saddam's immediate family, and was Saddam's key foreign policy and national security advisor. It was Tariq 'Aziz who deftly attempted to explain some of Saddam Husayn's most egregious actions, including the attack on Iran in 1980 that launched an eight-year long bloodbath, and the 1990 invasion of Kuwait that galvanized the world into action that culminated in the first Gulf War. Tariq 'Aziz was born Mikhail Yuhanna in 1936 into a Chaldean Christian family in northern Iraq. In the 1950's, after studying English at Baghdad University, he worked as a journalist and became an Arab nationalist. 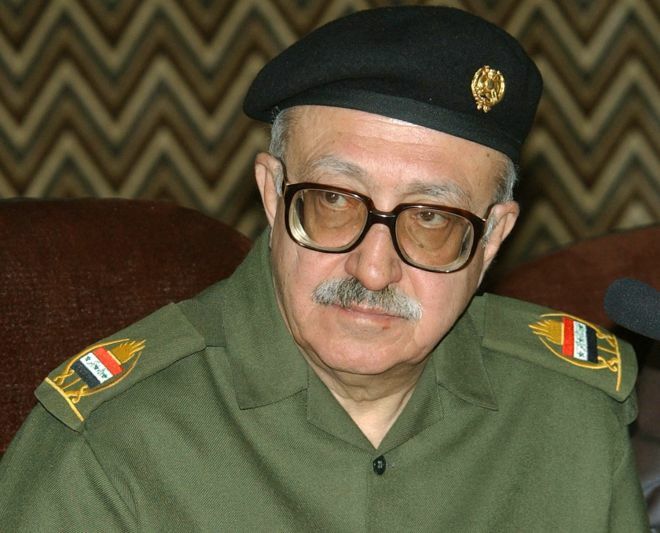 He was an early member of the Iraqi wing of the Ba'th Party, and an early compatriot of Saddam Husayn. After the Ba'th Party came to power in 1968, he rose through the ranks of the party, gaining even more power and influence when Saddam came to power in 1979. At that point, he became the deputy prime minister as well as holding key party positions. Although every Middle East specialist was keenly aware of Tariq 'Aziz and his role in the Iraqi regime, it was not until 1988 that I first met the deputy prime minister. In late 1987, the Defense Intelligence Agency (DIA) prepared an assessment that postulated that if the Iranians launched an expected annual spring offensive, this time starting from Iraqi territory captured in 1986 south of the key city of al-Basrah, there was a high probability that the Iraqi defenses would collapse and the Iranians would gain the advantage, likely winning the then seven-year long bloody conflict that had devastated both countries. An Iranian victory was inimical to American national interests in the region. The Department of Defense was instructed by President Ronald Reagan to take whatever actions were necessary to ensure that the Iranians were not victorious in the conflict. An Iraqi victory or defeat was not at issue - the only consideration was to ensure that Iran did not win the war and emerge as the key power broker in the Persian Gulf region. To that end, DIA was directed to offer to provide intelligence information to the Iraqi armed forces, via the Directorate of Military Intelligence. Such an operation would require the concurrence of Iraqi President Saddam Husayn. Advising Saddam to accept or reject the American offer would have been the ultimate purview of Tariq 'Aziz. 'Aziz was astute enough to realize that if the United States was willing to provide sensitive intelligence to the internationally-despised Iraqi regime, the situation was certainly precarious for Iraq and that Saddam should accept the offer. It was in this context that I met Tariq 'Aziz. It was a chance meeting, to be sure - he was not disposed to meet with U.S. Air Force captains charged with conducting the program at the operational level. He recognized me in the group of senior Iraqi military intelligence officers as obviously not an Iraqi, and since he had no doubt advised Saddam on the effort, knew why I was in Baghdad. We spoke for a few minutes, with him humoring me by carrying on the conversation in Arabic. I then began to understand why many Western diplomats and politicians were charmed by his easy and warm demeanor. Flash forward to 2003. Following the fall of Baghdad after the American-led invasion, Tariq 'Aziz - who was the "eight of spades" in the deck of wanted Iraqi officials - surrendered to U.S. forces April 2003. When he surrendered, U.S. Army military police and intelligence specialists searched his home. Part of that search was cataloging all of the books and documents in 'Aziz's office and library. I was surprised when I received a call from a friend working in the Pentagon's public affairs office - at the time I was working as a military analyst for NBC News (appearing on NBC Nightly News, Today Show, CNBC and MSNBC). 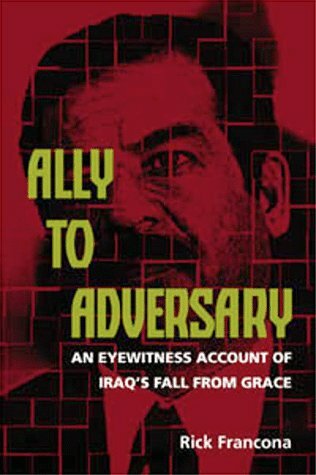 The officer told me that in the search of Tariq 'Aziz's home, they made an interesting find - a book entitled Ally to Adversary: An Eyewitness Account of Iraq's Fall from Grace by Rick Francona. I asked her if it was an autographed or personalized copy - it was a joke. I think I would have remembered signing a copy for Tariq 'Aziz.